We’re almost at the end of the line here, and you could tell by the look on Miz’ face, he knew what was in store for him next…Braun Strowman. 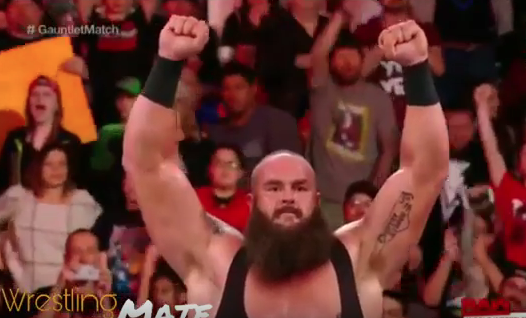 To the surprise of no one, Strowman wins the match over Miz by pinfall, and before heading back to the locker room, Strowman takes down the whole Miztourage. The gauntlet match had my top moments of the night for the most part, but I did enjoy the 6-women tag team match up at the end of the night as well. Mickie, Sasha and Bayley are a great team of babyfaces, and they took on Mandy Rose, Sonya DeVille, collectively known as Absolution, and the WWE Women’s Champ Alexa Bliss. DeVille and Rose show a lot of potential and look great in the ring in terms of physicality and gear, but they are still rather green, and together with Bliss, couldn’t pull off the win. I typically root for babyfaces, so I was glad to see the team of Sasha, Mickie and Bayley win. I do love the building camaraderie between Mickie and Alexa lately, it’s an interesting development and I wonder what it’s going to mean for Sunday’s Elimination Chamber match. It seems like Sasha and Bayley have each other’s backs (kind of), obviously Sonya and Mandy, since they are a tag team, and now maybe Mickie and Alexa? If Adam Levine leaves The Voice, who should replace him?